Drawings in an animation project are often exposed for more than one frame to save on production costs. In western animation, each drawing is usually exposed on two frames, and in Japanese animation, each drawing is usually exposed on three frames. In both cases, exceptions can be made for quick or detailed actions that require precise timing. In the industry, this type of exposure is known as animation in double or triple frames, or animation on twos or on threes. To save time when creating your scene's exposure, you can configure the Xsheet to hold the exposure. This will make every new exposure you type into the Xsheet exposed for the preferred amount of frames. After you enter the exposure for a cell, the selected cell will be after this exposure's hold, allowing you to quickly fill a column with exposure while respecting the selected hold. In the Xsheet menu, select Exposure > Hold Exposure > Hold the desired amount of cells. 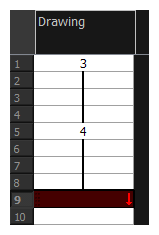 From the top menu, select Animation > Cell > Hold Exposure > Hold the desired amount of cells. Right-click on the Xsheet and select Exposure > Hold Exposure > Hold the desired amount of cells. Press Enter/Return to move on to the next cell. Press Esc to quit the typing mode.